Swings ignite imagination! One minute your children are fighting medieval dragons and the next they’re on a distance planet. Rainbow Swing Sets are a fantastic way to get your kids outside and active! Built to last and withstand the rugged outdoors, our original line of Rainbow Swing Sets are built with 100% Cedar Wood, one of the main reasons our swing sets hold their value so well. Rainbow Swing Sets’ incredible resale value makes them a smart investment for your family! This year we are adding new designs to our budget-friendly Cedar Collection. All of our cedar swing sets are built from 100% cedar lumber and backed by our exclusive lifetime warranty. Rainbow leads the swing set industry with its Lifetime Warranty coverage! You’ll be amazed by the incredible variety of designs available plus over 100 options to customize each design. We are confident you’ll find your family’s perfect swing set in our cedar collection. 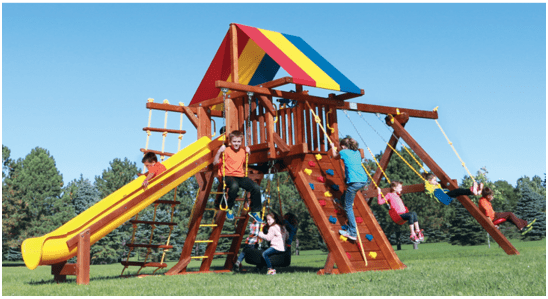 Rainbow Play Systems offer an amazing variety of swing sets and options. Preview our swing gallery to see just a handful of the swing choices available: belt swings, tire swings, buckets, and even fully wooden bench swings. The only problem you’ll face is making a choice. Enormous Try and Buy Showroom! 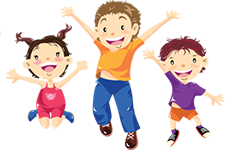 Bring your family to Run, Jump-n-Play, our family fun center and super showroom where you and the kids can play on a variety of Rainbow Play Systems. Shop for Quality Swing Set Accessories Right Here! Rainbow swing sets are built on a wide base and deck height never exceeds the width of the fort’s base. Rainbow Play Systems are expandable. Your family won’t ever outgrow your Rainbow swing set. DIY seems like a great savings until you consider how much time you will spend sorting through lumber bins, cutting and drilling, pounding nails, digging holes, and pouring cement. Don’t forget to include the cost of tools. Want to design your own swing set? We have some ideas to get you started. Feel free to browse our site for inspiration.